If you’re tired of looking in the mirror and seeing moderate-to-severe wrinkles and folds around your nose and mouth, it is time to come to MD Aesthetica for a dermal filler treatment. But which dermal filler is right for you? 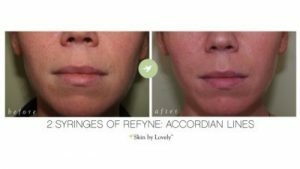 There are many choices available, and Restylane Refyne Houston is a great option for treating those pesky nasolabial folds and marionette lines. Restylane Refyne comes from Galderma, the makers of the popular Botox alternative, Dysport. This new Restylane family filler features their proprietary XpresHAn technology, an enhanced hyaluronic acid that provides smooth, flexible, natural-looking results with increased flexibility. Restylane Refyne is thicker than its counterpart Restylane Defyne, which is formulated to fill in mild-to-moderate nasolabial folds and marionette lines. Our patients here in Houston have seen amazing results since its launch and it is now one of our best selling fillers. Why choose MD Aestheca for your Refyne treatment in Memorial City or The Woodlands? MD Aesthetica is a top rated aesthetics practice as recognized by Galderma and Allergan, the makers of Botox. Our Aesthetic Injection Specialists are experienced in both administering injectables and training other providers in proper injection techniques. How is the Restylane Refyne Procedure Performed at MD Aesthetica? After a consultation and examination with one of our Aesthetic Injection Specialists, your provider will administer treatment to the affected areas using a fine-gauge needle. The injectable contains lidocaine, a local anesthetic, to ensure comfort during the procedure. Your provider will mold and shape the filler and give you aftercare instructions to ensure best results. How Long Does a Restylane Refyne Treatment Take? 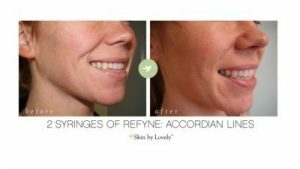 Treatment time with Restylane Refyne depends upon the amount of filler and number of injections required to provide you with the desired results though it typically is a quick procedure. If you require topical numbing in addition to the lidocaine contained in the filler itself, this will add onto your treatment time. Most dermal filler treatments take approximately 30-45 minutes to perform including numbing, but not including the consultation. Do Restylane Refyne Injections Hurt? Will Anesthesia Be Used? Each syringe of Restylane Refyne contains lidocaine, an injectable local anesthetic. In addition to the lidocaine, some patients also opt for a topical numbing cream and/or ice to increase comfort during treatment which we can apply complimentarily. Patients who receive injectable filler treatments describe the procedure as comfortable, feeling only a small pinch or poke with the injections. How Does Restylane Refyne Work? Galderma’s patented XpresHAn technology in Restylane Refyne is being called the “next generation” of hyaluronic acid fillers. Using a cross-linking of HA particles, Refyne’s gel-like solution gives patients a stronger foundational support without sacrificing flexibility or a natural appearance. When injected into wrinkles and folds around the nose and mouth, the gel immediately fills the area for instant plumping and smoothing. This allows patients to see their results right away while the hyaluronic acid gets to work drawing in moisture and stimulating collagen and elastin production for long-term results. How Long Do the Results of a Restylane Refyne Treatment Last? Every patient metabolizes injectables differently. However, in clinical studies, over 90% of patients were still satisfied with their results at 3 months and nearly 80% still saw great results at 6 months. Results were seen to last up to 12 months for 62.3% of patients. Am I a Candidate for Restylane Refyne? If you are over the age of 21, have moderate-to-severe marionette lines and/or nasolabial folds, and are in relatively good health, you are likely a good candidate for Restylane Refyne. Some exceptions include patients who are allergic to lidocaine or other ingredients in the filler, patients who have had an allergic reaction to other injectable filler treatments, or patients who have severe anaphylaxis. Women who are pregnant or nursing should also not receive Refyne or any other injectable anti-aging treatment. What Side-Effects Can I Expect Following a Restylane Refyne Treatment? Like with most dermal fillers, mild, short-term side-effects do occur with FDA-approved Restylane Refyne. During clinical trials, patients reported mild itchiness, tenderness, swelling, and bruising at the injection site. Bumps and lumps can also develop, but this risk is mitigated and reduced when you choose a reputable provider..
How Much Does Restylane Refyne in Houston Cost? Is it Affordable? As every patient at MD Aesthetica is given a custome treatment based on their desired look and goals so the costs associated with Restylane Refyne and similar fillers vary due to the amount of filler required to achieve desired results. During the consultation a quote will be given, Restylane Refyne starts as low as $600. What are My Payment Options for Restylane Refyne at MD Aesthetica? We accept most major credit cards, cash, and CareCredit at MD Aesthetica in Houston and The Woodlands for Restylane Refyne and other aesthetic treatments. Contact us today for a consultation and find out if Restylane Refyne is right for you.